Caprice and I left Gothenburg early September 2017 and arrived back home in June 2018. In those 9 months, I was at sea for about 7 months. The aim of my journey was to sail alone on the big seas. Rather than ‘cruising’ and visiting places, I wanted to make long passages and spend weeks at sea without stopping. I did have, and I still do have, a dream to sail around the world in the Southern Ocean. But I decided that I would just leave and then see how the journey panned out. 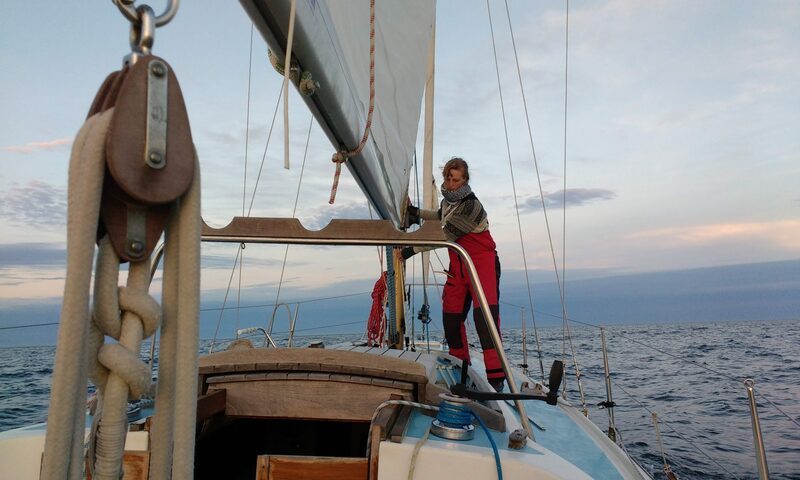 As it turned out, I decided to make a big figure of 8 in the Atlantic Ocean and I sailed a total of 15000 nm, half the distance of around the world. I did reach the Southern Ocean, but only just. Some dreams are good to keep, and mine is still very much alive. One day I hope to sail around the world, either alone or in company. The question I am asking myself and the question that many people ask me is of course, why do I do this? I will be left to the elements alone, left to the powerful sea, to which I have a huge respect. I wonder why my feeling to go was so strong considering the beautiful things that I might loose. But as my brother once said, life is like being in a spaceship without knowing how to use the controls. For me, this spaceship is my heart. Wherever it wants to take me I will go. And now my heart wants to go to the sea, to be alone, to visit places inside me which I could never find in this world without being left alone in nature for a long period of time. Being left to my own devices, relying solely on my strength and my own abilities. Where a small mistake of mine could be fatal. It won’t be easy. I will be scared, stressed and lonely. I will constantly worry about the boat as she is the one who has to keep me floating. Will something break, will she leak, will she hold? Will she see me through safely? Will I survive this storm, this leg of my journey? When times are tough I will promise myself that when I reach harbor I will never go again. These are the stories most solo sailors tell. And yet they always leave again. And there will be the good times – the beauty, the freedom, all the time to spend alone with the sea, with books, guitars, thoughts and proper time to reflect on this weird world that we live in. The sky, the stars, the sunsets, the sunrises. The vast silvery sea stretching all around me for days and days. I am drawn towards the southern ocean and that is where I wish to do my circumnavigation. There is something in the southern ocean that I dream of. The remoteness and the loneliness.